China (mainland) Shanghai Shanghai,No. 2020, Xinche Road, Songjiang District, Shanghai City In China. 2, Configuration of high quality plastic frame mute casters, the surface is smooth, shockproof, friction resistance, corrosion resistance, promote easy and flexible. the vehicle has beautiful, wear-resisting, impervious, resistant to corrosion, rust, etc, accord with human body ergonomics, improve production efficiency, and improve the working environment. 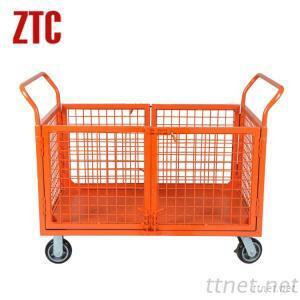 3, RCA-013 Flatbed Warehousing logistics trolley is made of high quality carbon steel material, good strength, bearing capacity is strong. Has the advantage of anticorrosive, antirust, easy to clean. 4, absolutely silent, give you a quiet and comfortable working environment, castor USES the Japanese technology, special nylon material, and coordinates with bearing, make the Warehousing logistics mobile trolley for silent, portability, pushing the lighter piece, greatly reduce the intensity of your work, improve efficiency. Wear-resisting degree is high, do not damage any ground. Double doors may open, easy to use and transport.